“From a layman to a professional, the Bora Saw Plate rips through materials with exact and perfectly straight cuts every time,” said Todd Gluski, Brand Manager for Affinity Tool Works. Affinity Tool Works, LLC., a dynamic, privately-owned global tool company providing professional and consumer tools under the BORA, Portamate and HTC brands, announced today the launch of the BORA Saw Plate and accompanying Rip Guide Handle (Available April 2015). 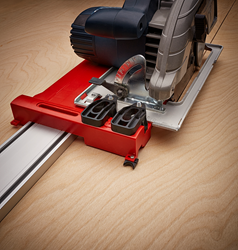 The BORA Saw Plate works in conjunction with most clamping straight edges or independently when combined with the Rip Guide Handle to make a circular saw guide. Paired together with almost any circular saw, BORA’s Saw Plate and Rip Guide ensure consistent cuts with uniform track saw-like precision. Blade indicator lines up directly with your blade insuring you can see where your cut will go. Designed to work with the Bora WTX Clamp Edge or any straight edge guide up to 3 1/2” wide. The Bora Saw Plate retails for $29.00, the Rip Guide Handle retails for $20.00, both are manufactured by Affinity Tool Works, LLC, based in Troy, Mich. For a complete list of dealers and retailers, please visit http://www.affinitytool.com or call 248-588-0395. Affinity Tool Works, LLC is a provider of professional tools serving a variety of markets including building and remodeling, do-it-yourself, industrial and woodworking. Designed to increase productivity, simplify complex tasks and help produce consistent results, the product brands under the Affinity umbrella include BORA, Portamate, HTC Products, and exclusive brands distributed include: FISCH, Tormek and Sjobergs. For more information, visit http://www.affinitytool.com.